The service and hymns composed for them highlights in various ways the purpose for which the Lord allowed such a great miracle to take place, namely, to get people to believe in the resurrection of the dead and to bury the unbelief of those who deny it. 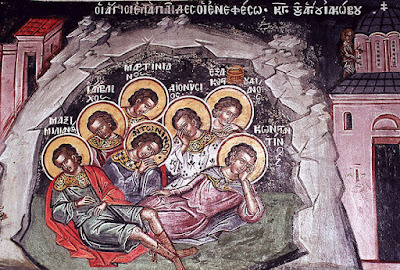 Their biography explains to us that at the time of the miracle, in the fifth century, a heresy appeared which challenged the belief in the resurrection of the dead, and such a denial negatively affected the Christian faith and the life of the Church, since the belief in the resurrection of Christ is at its foundation. Therefore, with the resurrection of the Seven Youths the Lord gave His response to establish the faith of the people, confirming that His resurrection was an indisputable fact, without which, as the Apostle Paul says, "our faith is vain". For Christ came to bring life to humanity, which was lost to us by our fall into sin. He said: "I came that you may have life, and have it more abundantly." To challenge the resurrection of Christ, as well as that of all humanity, means to erase the entire revelation of Christ, thus "burying" humanity once more into the elements of this world, namely sin, death and the devil. Yet this great miracle affirms something else even more important: the Lord never leaves Himself without His "witnesses", at no point throughout the course of history. It was not only His own historical presence that sealed world history with absolute certainty. This same presence is continuously brought into the spotlight through His Holy Church, as well as through the Saints of the Church and the miracles performed through them. Because unfortunately people, due to the plague of forgetfulness that catches us, get carried away by everyday life, and they engage with the world through their passions. Christ, however, as it has been said, "never leaves us at peace." He does something all the time, in each historical era, to place us before Him. This is what happened with the Holy Seven Youths, and it happened after them, and it happens today and always. This is how Elder Sophrony of Essex interpreted the charismatic presence of Saint Silouan the Athonite: he was a contemporary witness of the eternal love of God. This is also how Elder Paisios consoled us, saying that in the last days Christ will appear in a very powerful way, giving us strong signs of His presence, to strengthen us in our fight against the powers of darkness. We praise and bless the Lord for His love and His loving providence for us all.